Those of you have been following me a while will know that I had been planning on celebrating my big 5Oth birthday in July for quite a while. Whilst some of my friends have been dreading this milestone of a birthday, my attitude has been to embrace it. 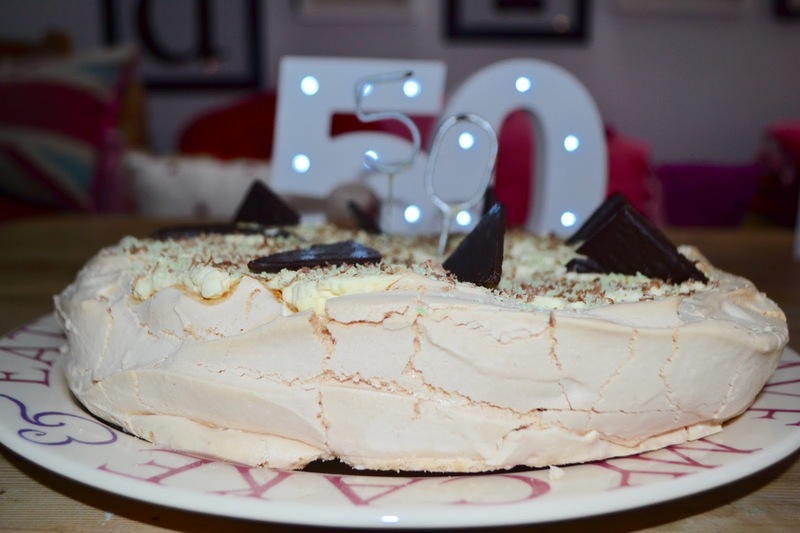 Why not celebrate being alive and relatively healthy as we reach this half century point? As my actual birthday was while we were away on holidays, I planned to celebrate it twice-at home and in Spain-indulgent, I know! 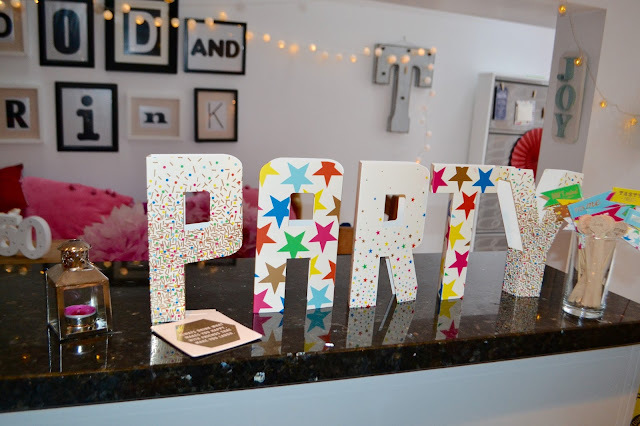 I wanted to do something a bit different for my party and exhausted a host of possibilities in terms of venue, all of which involved problems with regard to licensing laws, early closure times, limited catering options, insurance implications-I could go on forever! Eventually after much persuasion from others-and despite protestations from Lex-we opted to host it in our home. To ensure the evening ran smoothly, and to accommodate friends and family who would be staying overnight, I knew that I would have to be prepared and so a major decluttering and clearing out mission ensued with bags and bags of clothes being dropped off at various charity shops around the town as well as numerous trips to the dump to make the house 'party ready'. I was delighted when I returned home from work one afternoon to discover my dad and uncle busily repainting our deck and fencing-a job which we would probably never have got round to doing! 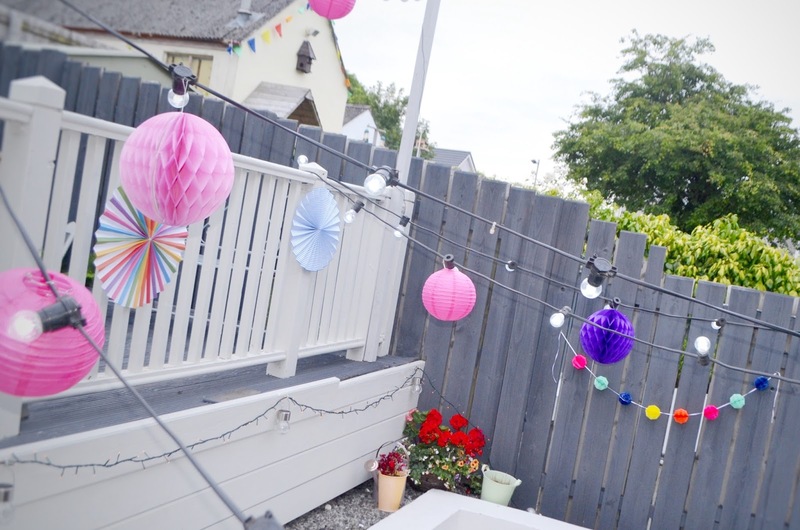 I wanted to create a 'fiesta' atmosphere with lots of indoor and outdoor lights as well as pom-poms, lanterns and bunting but my biggest concern was the weather as we had hoped to use the outside space to ensure there was a fluid feeling without guests being split between a number of rooms. 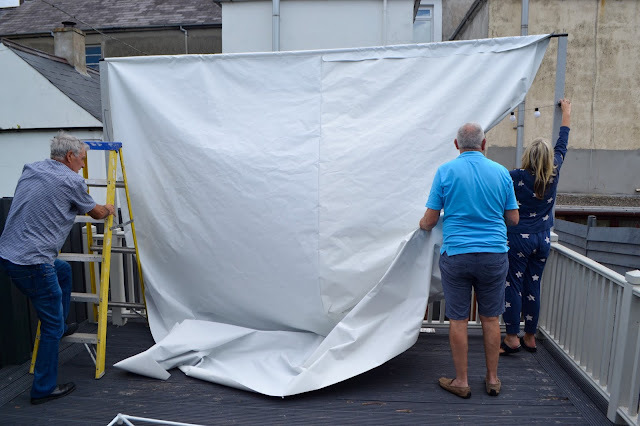 With this in mind, I was on a mission to source a large sail like canopy which could be attached between the rear of the house and the raised deck so that guests could be outside without running the risk of being soaked with our unpredictable weather. My search took me to the Play Resource Scrapstore, Belfast which, for an annual fee, provides free craft materials donated by industry and I was delighted when I found an entire roll of white ship sale fabric which was perfect for my project. I 'simply' (have you ever tried machining this stuff?) stitched two lengths together, hemmed a channel at each end and threaded metal poles through so that the canopy could be attached above our bifold doors and to posts in the deck. I was almost hoping it would rain to see my handiwork put to good use but was even more delighted when the sun shone all day-the hottest day of the year! I had been buying up outdoor solar lights-great ones from Home Bargains-but couldn't refuse when I was offered the loan of some outdoor festoon lights from a friend who works for a local council-20 yards to be exact. 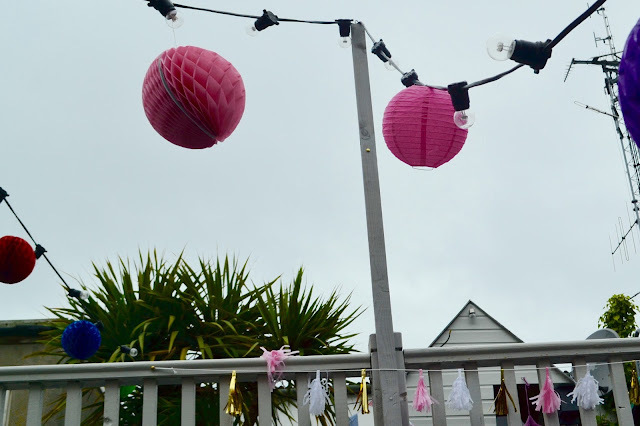 On the day of the party we moved our corner leather sofa up onto the deck, piled up throws and cushions for extra seating and moved our kitchen table into the neighbours' garden to create space for our dance floor. We also added a fire pit-£16 from TK Maxx-to provide heat when the sun went down and for the younger ones to have s'mores as a treat. I knew I wanted some kind of live music and I had a lightbulb moment one Saturday morning as my friend Rosie and I sat having our usual coffee in Caffè Nero-in the form of local busker Wayne Carr who entertains shoppers each Saturday on our main street. As he popped in for his coffee I took the opportunity to approach him and he immediately agreed to come on the night. Wayne played solidly for 4 hours with only one short break and had the guests enthralled, playing a range of songs which suited everyone-young and old alike. When we were let down by our caterers on the day before the party, I was delighted when our local takeaway came to the rescue-100 portions of chicken goujons, sausages and chips in cones delivered to the door-hot and steaming. I was expecting little mini cones but these were massive and I think totally hit the spot and were a success with everyone. Check out the size of those cones! I didn't want to have to spend the night worrying that everyone had enough to drink so I 'hired' two great girls who also happen to be my classroom assistants, to act as waitresses for the evening. We sat up a bar area in the living room, alongside an extra fridge, where guests could drop off and top up drinks and the girls were fantastic at ensuring everyone was well looked after. 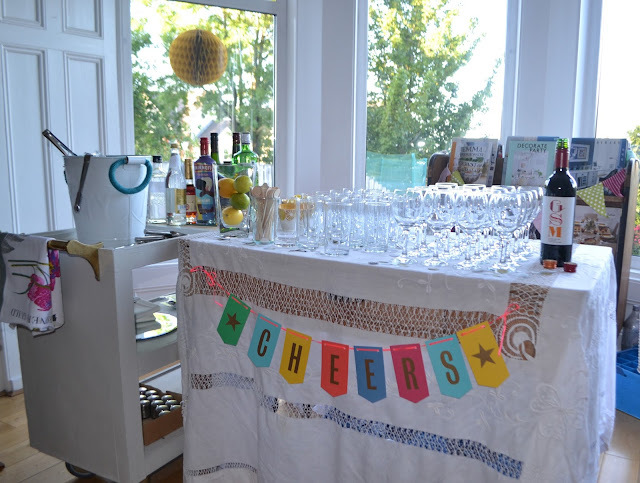 We hired the glasses-champagne flutes, wine glasses and tumblers from a local hire company for £18-you couldn't buy plastic ones for that price-and unbelievably not a one was broken on the night. I wasn't organised enough to have a birthday cake and to be honest I've found that not everyone likes cake at this type of party so was delighted when a friend Jenny appeared with mountains of mini cupcakes for everyone and another friend Deborah brought her home made pavlova. I hear that the cupcakes were amazing-I'm not sure how I managed to miss them all but I can vouch for the pavlova which was consumed the following day. What I love almost as much about a party itself is the 'post mortem' the following day. So many friends and family had made special trips to Bangor for the night from different parts of the country as well as Scotland and England and had booked into various locations around the town so it was great when they all called the following morning. Whilst the men tackled the issue of returning furniture from its various temporary locations, us ladies made copious amounts of tea and coffee, christening my gorgeous new Emma Bridgewater tea pot and Ted Baker cups and saucers and demolishing the delicious After Eight pavlova. So, would I recommend having a house party rather than an outside venue? Yes I totally would. It made life easier when we were able to take our time decorating the venue rather than having to squeeze it all into an hour or so beforehand when you'd much rather be relaxing having your hair done or sipping champagne with some early guests. For me the celebrations really began in the afternoon when various friends and relatives called in and even though some were roped into a few last minute jobs, it was a really relaxed run up to the night. All too often when we've had a party at an outside venue, afterwards has seen us invite everyone back to the house to continue the celebrating (including our wedding night!) so we would have spent time making the house party ready anyway. Unfortunately-or fortunately-I was too busy enjoying myself that I didn't get photos of the deck before everyone arrived. As my actual birthday was while we were in Spain we had to celebrate it again, right? This time we went for a venue which we regularly frequent when away and the lovely Sam agreed to host the evening in her bar, Finnegans. 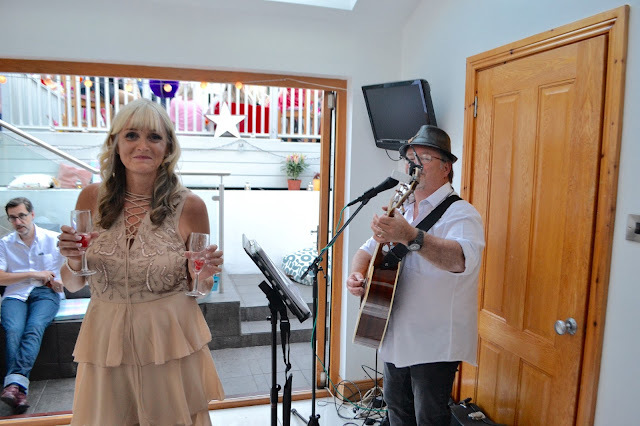 A long standing friend, Anne, is a singer so she also agreed to perform on the evening and had everyone up dancing in no time. Being in Spain, bars are child friendly so no baby sitting was required as old friends, new friends and cousins created their own little group whilst the adults revelled in more celebrations. I was yet again delighted and humbled that so many friends and family from all over made the effort to join us in Spain to celebrate yet again and yet again no traditional cake but instead this ingenious 'flump cake' made by my lovely Spanish friend Maria. I have to say it was a hit with children and adults alike. So, that was my birthday and I'd like to say that is all the celebrations over but I think I might adopt the attitude my husband had when he hit 60 and celebrate the entire year round. 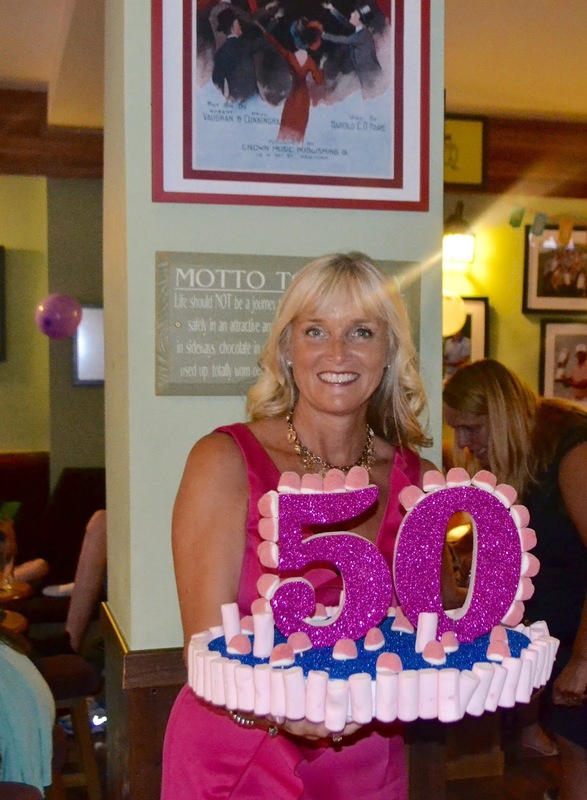 Having said that, I'm not sure how much celebrating this 50 year old could manage!